This post is written by Jasmine Cutter, one of our Hubbard Fellows. I think I’ve had unacknowledged tractor-envy for a while. Growing up in the suburbs, the biggest piece of “machinery” I dealt with was probably our push lawnmower. When I moved to Minnesota and the prevalence and presence of large farm machinery increased greatly, I’d often find myself feeling a little jealous of the people who got to drive combines (once I learned that’s what those giant things are called) and the other mysterious, long-limbed machines; they commanded so much power at their fingertips, and I wondered what the world looked like from so high. When I got to use a riding mower in Montana (my first time on non-automotive machinery), I thought that was fantastic. Thankfully, living in Nebraska has provided an antidote to my tractor-envy, and has given me a chance to refine my mowing abilities. 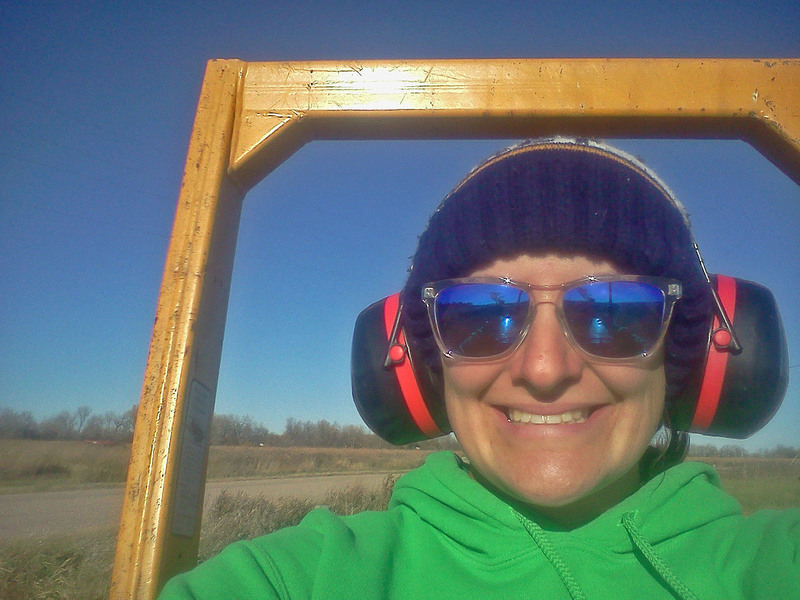 Ear protection: check! Cold protection: check! Awesome sunglasses: check! Don’t worry, I was parked. Photo by Jasmine Cutter. Dillon and I were lucky that soon after our arrival, Platte River Prairies acquired our new, shiny green John Deere 5075E tractor. There is also a well-used, slightly less intimidating, yellow John Deere 401B tractor. I knew that we would get to learn how to operate tractors as part of the Fellowship, but I was unaware of how vital the tractors are to our management here. Most of that was due to ignorance about how many ways a tractor can be put to use (sooo many ways! ), but I was also generally naive about how precious labor and time is to land stewards. My previous stewardship experience at Carleton College was in a relatively labor-rich context – working in the Arboretum was a work-study option – and many management objectives were tackled by teams of students wielding hand tools. The dynamic here is very different: there is Nelson, there are the two Fellows (we spend a lot of time on stewardship, but also have other projects diverting our attention), Sam for the last few summers, and Chris and Mardell come and help when they can. Even with the help of our wonderful volunteers who help collect seed and tackle other projects for us, we’re dealing with a lot less available labor. Needless to say, I’m learning a lot about how to prioritize management and how to efficiently tackle our management objectives. 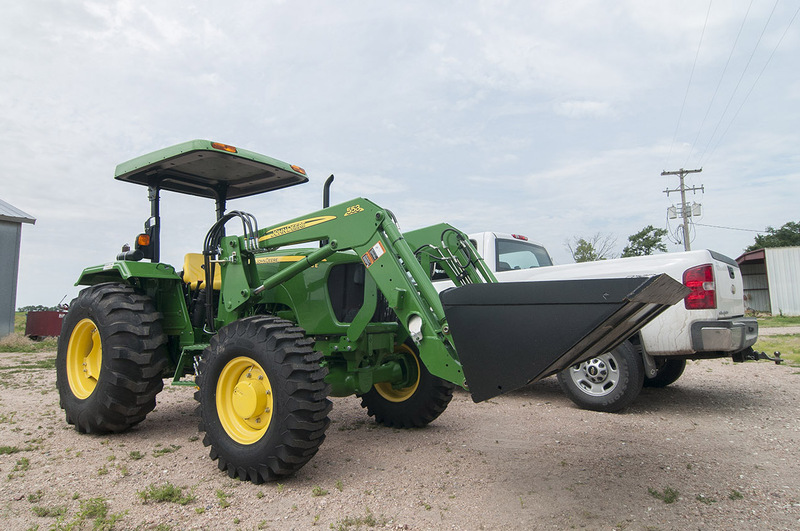 Ownership of a reliable tractor that is the right size and has the right attachments to fit our needs is essential to efficiently completing our stewardship goals. For example, we’ve been spending the last two weeks pulling out old fence line, and while we might be strong, we’re not fence-has-been-buried-by-six inches-of-dirt-and-sod-and-is-now-one-with-the-earth strong. I have tried tugging on those fences, and while we can make some progress, it’s amazing to operate the tractor and feel how easily our hydraulics enable us to tear out these wires that would take us days to uncover and pull out by hand. The mighty green beast in all its glory! Photo by Chris Helzer. Our tractors certainly help with efficiency, but simply stated, we depend on them as our primary implement for a lot of our stewardship and maintenance. Our tractors are essential to mowing firebreaks and fence lines, and for shredding invasive vegetation to a height that delays its growth and makes it short enough for our sprayers. When we need to spray a large area (which isn’t too often), the tractor – and Nelson’s innovative spray setups – save us a lot of time, and give us a powerful tool against our more entrenched patches of invasive plants. The tractors are also used for pulling out stuck vehicles (not that we ever do that) and for navigating terrain that’s too swampy for our other vehicles. I love our tractors because they enable us to accomplish our objectives, but I also appreciate that they give me a chance to hone a different set of skills. Tractor operation requires attention to detail, especially spatial awareness. I need to be able to judge terrain so I don’t tip over, I need to make sure I’m far enough from co-workers and vehicles that I’m not going to damage anything or anyone, and I also need to know which part of the tractor is going to move when I pull a certain lever. Because they are so powerful, it’s hard to undo something once you’ve done it with a tractor. There’s also a lot of multi-tasking. It’s surprisingly challenging to simultaneously steer, manage my speed, avoid obstacles, engage the correct lever, and ensure that I’m spraying (or mowing) what I intend to. But I’m feeling more confident in my abilities every day. 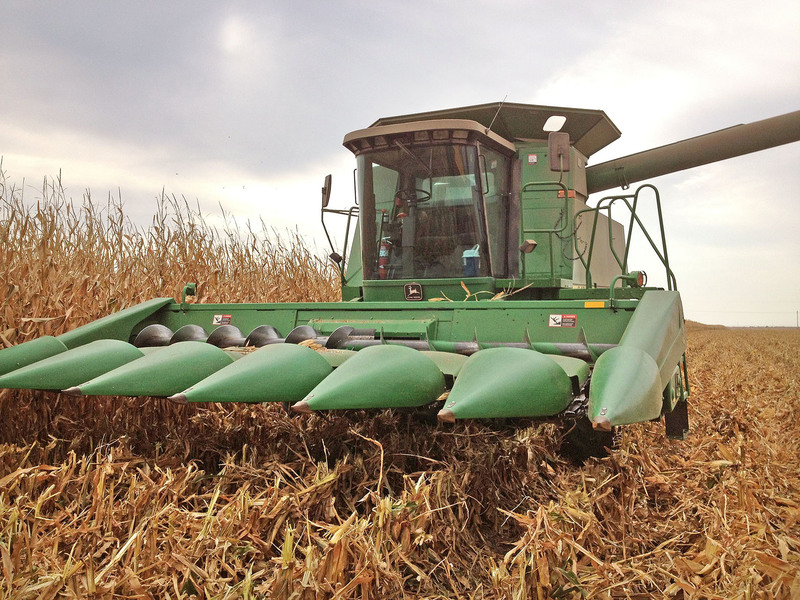 During the corn harvest, our neighbors invited us out to ride along with them in their combine and corn wagon. Years of curiosity finally fulfilled! Photo by Jasmine Cutter. Tractor time is also appreciated because mowing or spraying is relatively slow-paced compared to most of our stewardship tasks. For all their might, when you’re mowing with a tractor, the swath you’re able to cover is only as wide as the shredder attachment, which is a relatively unimpressive nine feet or so. When you’re covering several dozen acres nine feet at a time at 5mph, that is a lot of laps. But honestly, I really value this time, and the chance to examine every foot of our property (or at least every foot of the perimeter). I’ve honed my ability to identify plants while in motion, discovered gates I never knew existed, observed how voles move through the thatch, and gained a better understanding of how the plant composition of our units shifts with topography. Our tractors are also indirectly beneficial to my life here. When the farmers are talking about their machinery, I have at least some idea of what they’re talking about, even if our tractor is maybe half the size of theirs. I now know what a PTO (Power Take-Off) is, I have stories about nearly tipping over (there was a buried beaver lodge), and I am able to get some respect when people learn that I drive the tractor, just like Nelson or Dillon. Dillon driving the John Deere. Self portrait by Dillon Blankenship. While I’ve satiated the majority of my machinery-related curiosity, my only remaining wish is that I have a chance to operate the mythical skidsteer. I saw one in action at Carleton and marveled at its ability to wrench stumps from the ground (something we desperately need help with along our old fence line). Nelson has told us tales of their dexterity and usefulness at our Rulo site. Hopefully I will get a chance to drive the beast when we rent one in the spring; just think of all the farm cred I’ll garner! 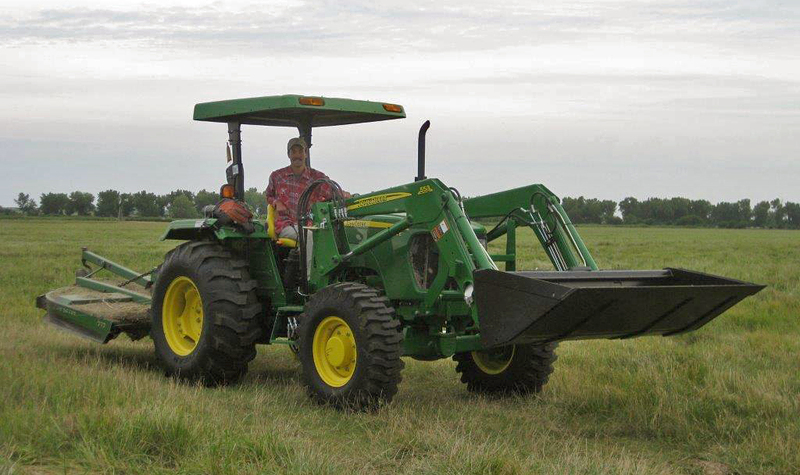 This entry was posted in Hubbard Fellowship, Prairie Management and tagged fellows, heavy equipment, hubbard fellowship, jasmine cutter, land management, prairie management, tractor, tractors by Chris Helzer. Bookmark the permalink. What a great post, Jasmine! You have a gift for telling a story. Chris, you do hire such excellent fellows. We’ve really enjoyed having Anne Stine in our part of the world. Oh yeah and, Carleton – Great school! Somehow I do my best thinking on the tractor! Thank you for this darling post! It certainly takes me back to my days on the farm and all of the work our tractors did. I had an Allis and we put up alfalfa for our dairy cows. It was a very logical tractor. When cutting, the lever went down to put the blade down. Occasionally, I was stuck using the John Deere my Dad used. Ugh! It was illogical. In order to put the blade down, you pulled the lever up! The sun shade is nice. When we rode in the combine I was impressed by how much of a difference having an enclosed cab makes! Dillon and I have been joking about getting noise-cancelling headphones so that we can listen to podcasts while we protect our ears. Dust/pollen-inspired sneezing attacks are definitely still a hazard. I wish that we had Flonase and Allergra when I was in school! As it was, the choices were to have the allergy attacks or to be sleepy on the tractor. Neither was a good choice. I don’t know what a podcast is, but if you get the chance to use those headphones, then happy trails! Considering that the rate of occupational injury and death for farmers is right up there with fishing and coal mining a healthy respect for the dangers are important. Friend of mine fell asleep mowing and didn’t wake till he had a thousand feet of fencing trailing behind him. Could have been much worse. Clearly, it is possible to do great restoration/management work without machinery. I definitely do think about how using large machinery affects our relationship with the land. As someone who has rapidly gained an immense appreciation for the ridiculous amount of time and energy that go into restoration/management, I think that overall, our sites would be much worse off (neglected) without some mechanical/time saving help. Although Chris, Mardell, our volunteers, and Dillon and I do help out a lot, at the end of the day, it mainly comes down to Nelson who’s responsible for managing the 1000 acres in the immediate area and the 5000 acres within his jurisdiction. With anything, there are certainly tradeoffs. I think that we are very cognizant about the pros/cons of owning so much land and trying to maintain it to the best of our ability. I am still learning, and observing, and I am always interested in hearing how others approach some of the same dilemmas we struggle with. I think it is always really important to be mindful of invasives and the (accidental) movement of invasives. Good point. And, I totally understand. haha In college, my friends were talking about “drive your tractor to (high) school” day and I couldn’t even conceive of such a thing happening in my part of Delaware (the urban part). I was trying to imagine what that would look like if someone showed up to school with a tractor, and couldn’t. A) I don’t even know where you’d find a tractor within 30+ miles, and b) I can’t imagine what roads you could use to get it in! That was the main impetus to my article. To share how thankful I am for a chance to experience a completely different context, and a different landscape. Also, the smiley face I put behind the comment indicating it was a joke did not come through. When you are driving a tractor, you can use any road you want!!! !Most people know enough to give you right of way. Those that don’t, you move them out of your way!!!!! And this is why I am not allowed to drive them!!!!!! Well, Jasmine, I finally read your post and was really impressed. I wasn’t expecting to have the error of my thinking pointed out to me, but so it goes. Having also been introduced to the conservation world with A LOT of manual labor (imagine two people with rock bars trying to move a boulder considerably larger than myself), I had developed an admittedly snobbish attitude towards using machinery to accomplish tasks that can be done by hand. But I see, when you can rip fence posts with a tractor in the fraction of the time it takes to hammer them out with a post pounder (and not exhaust yourself in the process), you are freed up to finish so many other management objectives.